As I walked with my little boy to his nursery this week, we talked about the changing seasons. He was given a perpetual calendar for his birthday, which also records the time, weather and changing seasons, so we have enjoyed watching the almost daily changes that this time of year brings. As we walked through the cold and crisp weather and talked about the bare trees now devoid of leaves, we passed by the garden of a huge house. He spotted that a huge leaf pile had been swept into a corner of the front garden and announced ‘this bit is still autumn’. 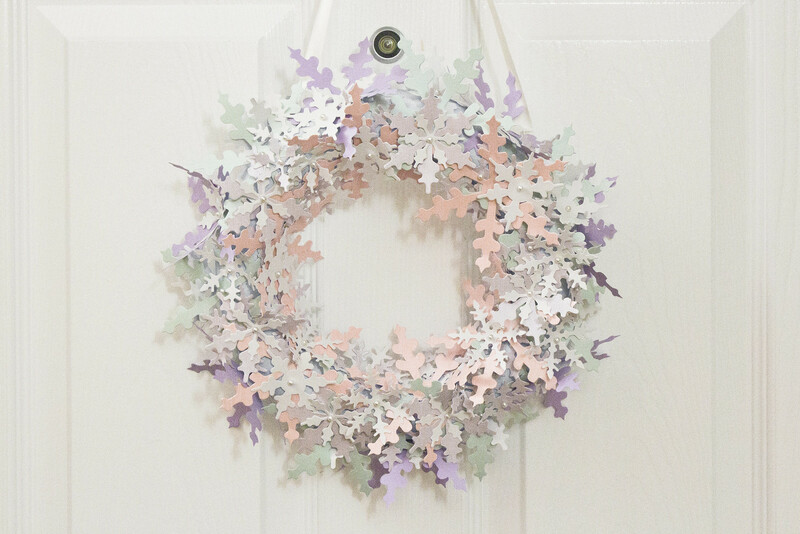 I resolved then to change the bit of our home that was ‘still autumn’ and to make a replacement for the paper autumn leaf wreath on the front door. I have had a box of paper snowflakes for years. I am not sure how many years, but I think I bought them either before I had my little boy or whilst he was a babe in arms. I am pretty sure my husband asked what I was going to make with them when I bought them (memory also suggests that the whole box cost me £1), and I am pretty sure that I shrugged and said ‘something’. 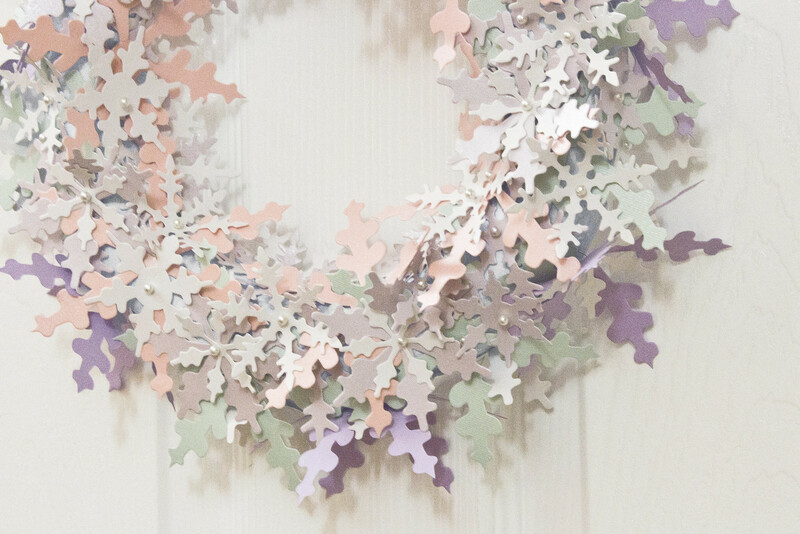 Well, finally that something turned out to be a winter snowflake wreath for our front door. 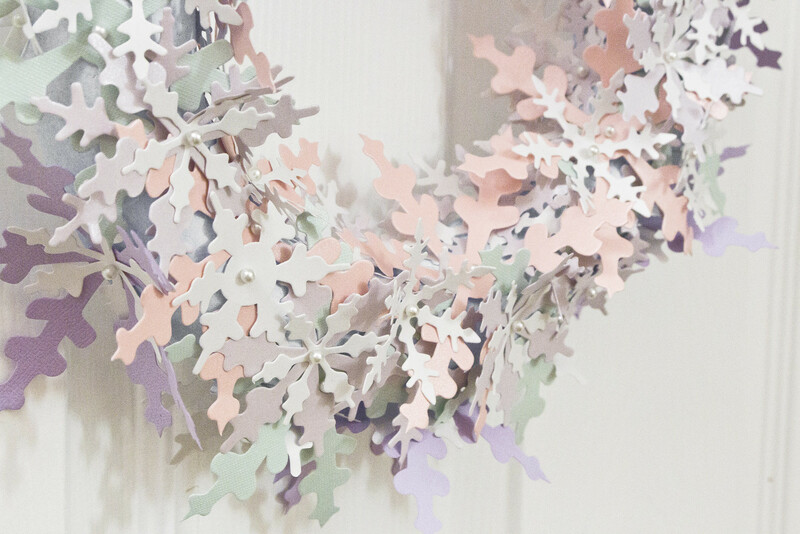 I bought a polystyrene wreath form from Poundland which I painted light blue with acrylic paint. In hindsight next time I would leave it white or paint it to match the colour of one of the papers used for the snowflakes, but at least it does not stand out too much. I didn’t shy from including the pastel colours and left out only the seven huge dark red snowflakes that were included in the box of paper shapes that I bought. 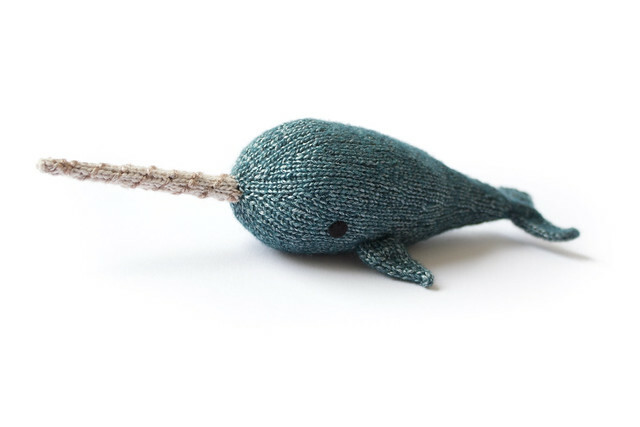 I had asked the good people of Twitter what type of glue I might use to attach card/paper and polystyrene, as it has a tendency to melt or dissolve when in contact with solvent-based glues, when Coopknits asked whether I might use dressmakers pins directly into the polystyrene form. It was the perfect solution, and exactly the technique I had used when making my bridal bouquets, being both secure and even adding a small element of unobtrusive decoration by way of pearl-headed dressmaker’s pins. Though the wreath form is crowded with snowflakes, I attached them in a planned manner, dividing the wreath form into seven segments and placing the snowflakes (of which I had seven of each size, shape and colour) evenly and methodically into those sections. Only the very top, small white snowflakes did I place in a less methodical manner, to give a more random look to those topmost flakes. Since finishing the wreath I keep changing between loving it and thinking that it’s just a big mess of paper, which in many ways it is. But it is like a chaotic flurry of snowflakes. It is airy, light and works well in our brightly lit hallway, and I think does a superb job of seeing away that part of our home that was still autumn so that we can welcome in the festivities that winter promises.